The purpose of this post is simply to remind me to consider autoimmune encephalitis in patients presenting to the office with even just subtle acute or subacute behavioral or acute mental status changes. And to move promptly to refer to the emergency department or neurologist if indicated. The most important resource for primary care clinicians is actually Resource (3) Meningitis And Encephalitis article and podcast from The Internet Book Of Critical Care by Dr. Josh Farkas. In addition, I’ve included three additional resources, (4) – (6), on other aspects of encephalitis. This post consists of excerpts from Resource (1) below, A clinical approach to diagnosis of autoimmune encephalitis. providing guidelines to navigate through the differential diagnosis. Because autoantibody test results and response to therapy are not available at disease onset, we based the initial diagnostic approach on neurological assessment and conventional tests that are accessible to most clinicians. Through logical differential diagnosis, levels of evidence for autoimmune encephalitis (possible, probable, or definite) are achieved, which can lead to prompt immunotherapy. To improve the recognition of these disorders, in this Position Paper, we aim to provide a practical clinical approach to diagnosis that should be accessible to most physicians. These guidelines focus on autoimmune encephalitis that presents with subacute onset of memory deficits or altered mental status, accompanied or not by other symptoms and manifestations, with the goal of helping to establish a prompt diagnosis. 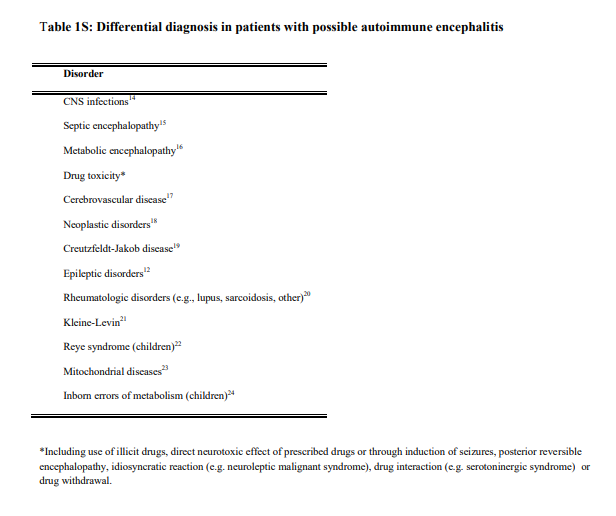 These guidelines do not address the clinical approach to other CNS autoimmune disorders (stiff person syndrome,24 progressive encephalomyelitis with rigidity and myoclonus,25 or autoimmune cerebellopathies26) that usually present with a clinical profile clearly different from autoimmune encephalitis. Existing diagnostic criteria for autoimmune encephalitis are too reliant on antibody testing and response to immunotherapy.27 In our opinion, it is not realistic to include antibody status as part of the early diagnostic criteria in view of the fact that antibody testing is not readily accessible in many institutions and results can take several weeks to obtain. Furthermore, the absence of autoantibodies does not exclude the possibility that a disorder is immune mediated, and a positive test does not always imply an accurate diagnosis. Use of the response to immunotherapy as part of the diagnostic criteria is also not practical because this information is not available at the time of symptom onset or early clinical evaluation. Some patients with autoimmune encephalitis might not respond to immunotherapy or could need intensive and prolonged therapies that are not available in most health-care systems unless a firm diagnosis has been pre-established.28 Conversely, patients with other disorders might respond to immunotherapy (eg, primary CNS lymphoma). The clinical facts and evidence suggesting that early immunotherapy improves outcome29–31 have been considered in the development of the guidelines presented here, in which conventional neurological evaluation and standard diagnostic tests (eg, MRI, CSF, or EEG studies) prevail in the initial assessment. This approach should allow the initiation of preliminary treatment while other studies and comprehensive antibody tests are processed and subsequently used to refine the diagnosis and treatment. basis, are not included in the main text because they usually follow a more chronic course and the initial or predominant symptoms (peripheral nerve hyperexcitability, or focal seizures and unilateral deficits) are different from those mentioned above. We recognise the overlap that can occur between these disorders and autoimmune encephalitis and for this reason they are discussed in the appendix. 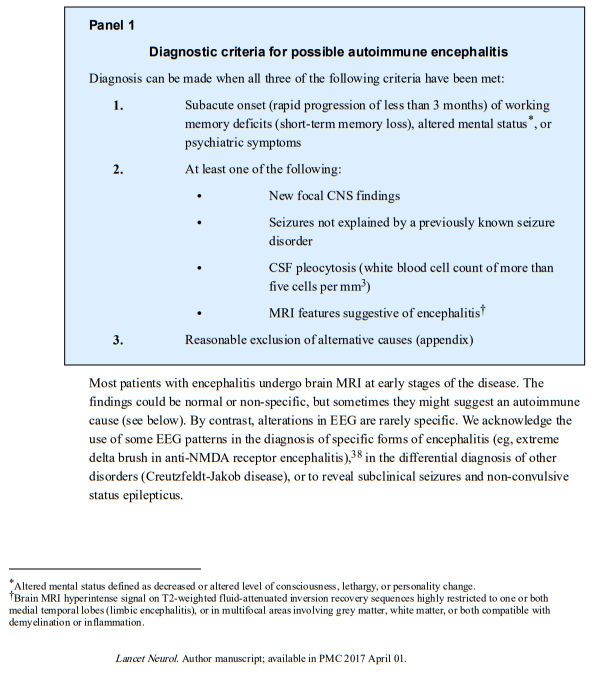 We regard a patient with new-onset encephalitis as having possible autoimmune encephalitis if the criteria shown in panel 1 are met. the level of consciousness, or with normal brain MRI or CSF results.7 In this context, memory deficits refer to the inability to form new, long-term memories owing to hippocampal dysfunction, or problems with working memory, which refers to structures and processes used for temporary storage and manipulation of information. (appendix)* [Link is to the download of the appendix PDF]. The rest of the article is worth reviewing. In addition I’ve included additional resources on encephalitis below. (1) A clinical approach to diagnosis of autoimmune encephalitis [PubMed Abstract] [Full Text HTML] [Full Text PDF]. Lancet Neurol. 2016 Apr;15(4):391-404. doi: 10.1016/S1474-4422(15)00401-9. Epub 2016 Feb 20. (3) Meningitis And Encephalitis article and podcast from The Internet Book Of Critical Care by Dr. Josh Farkas. This entry was posted in Autoimmune Diseases, Critical Care, IBCC By Dr. Josh Farkas, Neurology. Bookmark the permalink.